A year ago, I wrote about the release of this book, click here to read. I so looked forward to reading it that when I had the opportunity to purchase it, I did so without hesitating. collection of short stories set around a particular house known as the "family house" owned by one "gran pa". The stories are somewhat a mixture of superstitious, folkloric, traditional and modern day stories. I couldn't connect neither with the writing nor the stories, I had to give up. Have you read this book before? If you have, I'd like to know your thoughts, a guest post would also be appreciated. Please click here if you'd like to guest post. I'm surprised you didn't like it. I liked it a lot. How many pages did you read before you stopped? 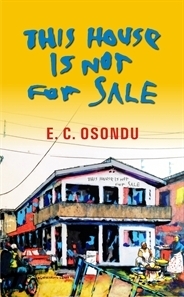 Osondu same name as the writer. I stopped at page 80. I might give it another try in the future. Lol yes o same name. Okay, I hope you can but I understand. I have his Voice of America novel here and I hope to read it later this year. Yeah. I didn't like his 1st book 'Voice of America'. The stories were not exciting at all. I didn't even look forward to this new book... meh. Voice of America was..... digestable... readable... I liked it really. Not bad at all.